One slight correction. Only two of us were in Delhi. The third, the mother/grandmother was in Canada. We do not believe that our stories are at all unusual. There was much courage and heroism in this Battle that has gone completely unreported, as far as we can tell. 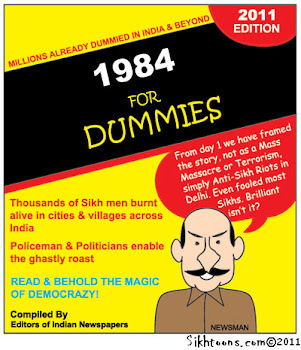 There seems to be a great glee in reporting Sikhs as victims, not heroes. We have all three heard other stories from survivors of the shaheeds appearing, especially where Guru Ji was present. We have also heard of Guru Gobind Singh Ji himself appearing. These stories need to be told when those who experienced them are recovered enough to expose themselves as we have. We were no stronger, braver or more heroic than many, many others. And none of us were all that devout. We are not saints. One of us, in particular, strayed far from the Khalsa Panth in the intervening years, but is now trying to come home. We need also to give great financial, psychological and spiritual aid to the survivors, especially the widows and their children in India who are today living in squalor. These are real, live human beings who have not had the chance to recover that we have had as Canadians. Our stories have been on the Internet for some months. 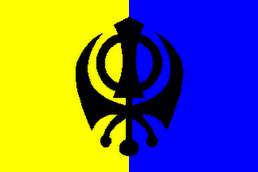 No one knew of them until Google Alerts picked up 'Khalistan' in this new blog. Please, those of you who have these experiences, blog them, put in words that will be picked up, so they will be read. We need to tell our own stories. Otherwise, believe me, our enemies will. We were asked, are these stories of ours true. The short answer is: Yes. The long answer is: Yes, unfortunately. And would someone please teach this spellcheck that 'Khalistan' is a correctly spelled word. When I read this blog I feel like it is the information that nobody "in power" wants us to read, but the information that we SO DESPERATELY need to know, the knowledge that we so urgently need to pass to our current and future youth, and the information that finally gives honour back to the dishonoured who battled against the monsters in human bodies in 1984. Thank you. Publishing this and leaving ourselves open to who-knows-what is nerve-wracking for us. Our honour has never left us Sikhs; we have just been slow to claim it. I believe that when the Sangat collectively realises that this was indeed a battle, that we were not 'sheep to the slaughter,' but brave warriors, daughters and sons of Guru Gobind Singh Ji, that this will go down as among the greatest of our battles. But we have to wake up and make this happen. And wouldn't it be nice if they really were 'monsters' and not our very, very human neighbours? REQUEST / SUGGESTION -- before many of the Sikh websites start to link to this blog, you should change the location to "roadtokhalistan.blogspot.com"
Great suggestion. Done. wE THINK.